Castleford Tigers have extended Matt Cook’s contract, keeping the consistent forward with the club until the end of the 2019 season. Cook signed a two-year extension with an option of a third year in 2016 and has since continued to improve his game under Daryl Powell. 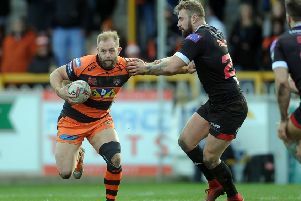 The 31-year old forward was a key part of the Tigers 2017 squad which lifted the League Leaders’ Shield for the first time in the club’s 92 year history, playing 23 games. A veteran of over 200 professional games, Cook has played for Bradford Bulls, Hull KR and London Broncos in his club career while also playing twice for England back in 2006. Cook is delighted to have his future secured so early in the season. He said: “We’ve had a tough pre-season and a tough start to the year. I was in the last year of my contract and needed a big start and a big year. Head coach Daryl Powell said: “Matt Cook has been a consistent player during his time at the Tigers and has this season shown an ability to improve again. “His energy coming off the bench for us has been fantastic and I am confident he will continue to get better. He is also a quality bloke who adds as much off the field as he does on it. Tigers’ director of rugby Jon Wells commended Cook for his professionalism over the past few seasons. He added: “Matt is one of the Tigers’ unsung heroes. He has been a hard-working, durable and extremely effective member of our team for over three years now and this extension is recognition of his value to the club.